Both WordPress and the plugin WooCommerce are free for personal and commercial use. So you can install and start using them immediately. This doesn’t include a domain, hosting, email, theme, support etc. In other words you’ll have to consider additional expenses. However, most of these features are included at no extra costs in proprietary solutions like Shopify. Using a good hosting provider can save you a lot of trouble. A good start is Bluehost. They have been in the market since 1996 and power over 2 million websites worldwide (incl. online stores). 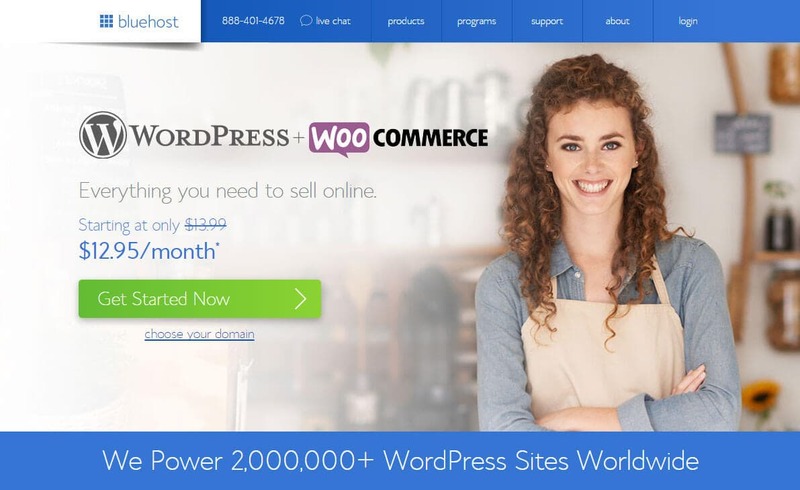 Some of their offers focus on several pre-installed “WordPress + WooCommerce” bundles. This can be quite handy if you don’t have the technical skills to set it up for a test installation. Bluehost also provides a walkthrough video series for beginners. This will definitely help you with your first steps. If you have some trouble, you can contact their support as well. Another (quality) alternative to Bluehost is SiteGround. They have WordPress (WooCommerce) optimized servers, advanced WordPress tools (e.g. staging or automatic plugin updates) and one of the best support I've ever had. On top of that, they have a free useful WooCommerce ebook. However, we highly recommend to ignore all their suggested offers while you set up your website. Normally, you won’t need them. If you don’t want to go with Bluehost, you can also find alternatives we recommend in our FAQ. Your next challenge is finding a professional theme. One thing that we’ve seen over and over again is that beginners struggle with WordPress themes. Keep in mind that it has to be compatible with WooCommerce. If not, don’t waste your time and look further. A well-written documentation and support can make or break your online store dreams. Free themes can be great if you are a skilled developer, but as a novice you will run into problems - and what then? Bluehost support can’t help you here, because they didn’t create the theme. A fantastic source for WooCommerce themes is Themeforest. 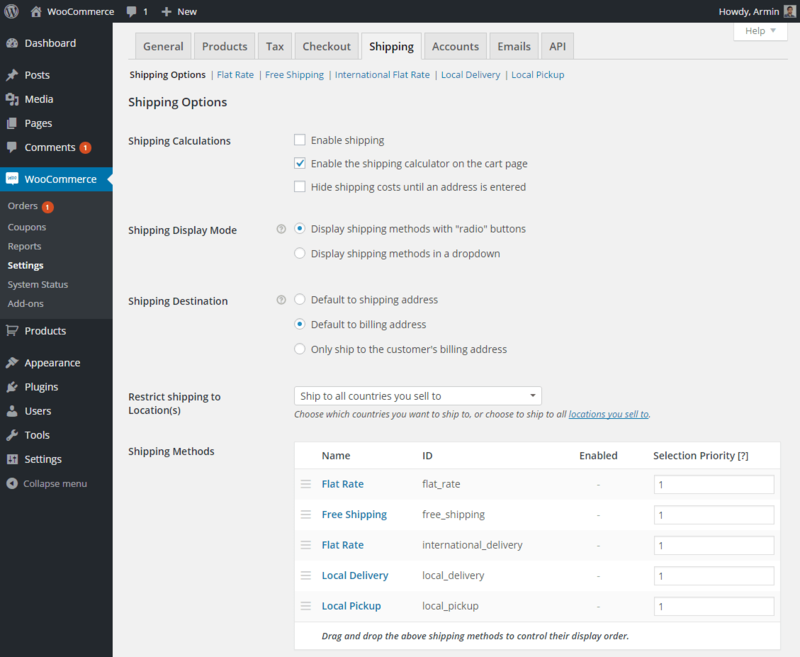 Their themes support the latest version of WooCommerce, which is also essential for security, and come with premium support. What about security with WooCommerce? This is another reason to use a premium theme. They update the template files in order to guarantee the security standards. Of course, there’s more to consider. Most probably you will require extra plugins to add new features to your store. This can be for SEO or just a simple contact form. Make sure you pick well-established plugins with a good rating used by many users on the WordPress repository. Bluehost has a 30-Day Money-Back Guarantee. You can sign up here. Webspace limited to 100 GB. Unlimited space for your WooCommerce store. Includes an advanced backup solution. Prices per month. Domain and email included. Bluehost offers discounts for the 1st year. Learn more about pricing for WooCommerce stores here. No only is there is a huge WooCommerce community, but you also benefit from an equally vast selection of plugins and extensions that can make your online store even more powerful. Having customer and admin accounts with different rights is no problem at all. Customers can also do a guest check-out without any account. There is a ton of both free and paid WooCommerce themes available. Modifying them depends on the theme settings and on your skills, but generally you can adapt anything if needed. Even though you can start with a preinstalled version, the setup process can be quite a pain for inexperienced users. Unlike with Shopify, you won’t have central support. Every theme, plugin and hosting come with different support channels. Free sounds great but it can later mean serious problems. If you find WordPress.org difficult to use then WooCommerce is not the right platform for you. Hosted store builders like Shopify and BigCommerce are easier to use. It is possible to install mobile-optimized templates or even develop your own template. However, be aware that customizations may require technical knowledge. Find some examples of WooCommerce themes on ThemeForest or check out WooCommerce’s own Storefront theme. Depending on the theme, easily add a zoom function, picture gallery and videos. This is very powerful and allows you to have different colors, sizes and other attributes. Once you get it, it will save a lot of time. The backend gives you control of many cart functions including a one-page checkout (paid feature). There’s also a paid add-on for cart abandonment emails. It is possible to add a user based reviewing system for products. You can add your own SKU (Stock Keeping Unit) number to each product. Standard payment options are: bank transfer, cheque, cash on delivery, and PayPal. You can easily add other payment methods like credit card via add-ons, but this can result in extra costs. Fortunately, the Stripe add-on is free now. Not a problem. Additionally, set a login requirement for the products that you offer. It’s even possible to force the whole check out process as SSL encrypted (provided you have a SSL certificate). Decide whether customers need to register or not with just a few clicks. This can be handy for returning customers. Many options like free shipping, product and cart discount are available. There are many built-in shipping rate options available. Shipping carriers (UPS, FedEx, etc.) can be added via add-ons. Dedicated plugins make it possible to sell via dropshipping. AliDropship, for example, enables you to import items from AliExpress to your store with only one click. Very flexible tax settings, for example define reduced rates and zero rates. If you need stock management, get either ‘low stock’ and ‘out of stock’ notifications. Adding a header and your own colors can be done without coding. For more design flexibility you can switch the email template as well. Importing products is possible, but there’s no built-in function available. You’ll therefore need a plugin or add-on. WooCommerce provides detailed reports about your orders, customers, stock and taxes. If you need even more insights, you can also add Google Analytics. An add-on or plugin is required (extra costs). It allows you to export your orders in a .CSV format. WooCommerce is as powerful as Shopify, and it gives you even more control since you can decide where you want to host your online store, but it’s by far less beginner-friendly and certain features aren’t included in the core system. Stan Lee, the author of the first Spiderman, wrote: “With great power there must also come great responsibility!” This is exactly what you’ll have with WooCommerce. It’s powerful, but at the same time it can give you a really hard time. There are so many possibilities for what you can do with WooCommerce, but this can become quite overwhelming for a beginner. Even though WordPress and WooCommerce are pre-installed with Bluehost, the technical knowledge that’s required is pretty high (and we’re not even talking about coding). Fortunately, WooCommerce provides detailed and well-explained video tutorials that will help you with setting up your store. However if you run into problems, even if you are a Bluehost customer, the only option you have available is a community forum. The quality there can vary heavily. In our test we had to wait longer than 48h to get a response. We were also surprised about all the hidden costs that you will face if you want to add certain features. Most of them are included in other solutions such as Shopify and Bigcommerce. Even though the core system is free, all these add-ons can turn out to be very pricey. On the bright side, it’s fantastic that you such a big pool of themes to choose from: Themeforest alone features more than 2,700 WooCommerce-compatible themes. If you want to test WooCommerce you can take advantage of Bluehost’s 30-day money back guarantee. Should you have problems with that, perhaps have a look at some of the alternative solutions instead. They could save you some headaches. > Check out Bluehost’s WooCommerce offer here! WooCommerce requires WordPress. We also have a WordPress beginner-guide if you want to know more about the world’s most popular CMS. If you are not very technical, Shopify might be an excellent WooCommerce alternative. It includes (high-quality) hosting and doesn’t require manual setup. If you get stuck you can always contact their support. A downside is that it is not quite as flexible as WooCommerce and that setting up a multilingual website is only possible via expensive external add-ons. Find more information in our WooCommerce vs. Shopify analysis. Still looking for an easier alternative to WooCommerce? Let our smart finder decide for you in 2 minutes. Is there a cheaper alternative to Bluehost? You can check out 1&1’s WordPress packages. They start at around $7.99 per month and also offer hosting that is optimized for WordPress. Also, there is Siteground, who offer a pre-installed WooCommerce environment for $9.95 per month, which is suitable for up to 10,000 monthly visitors. 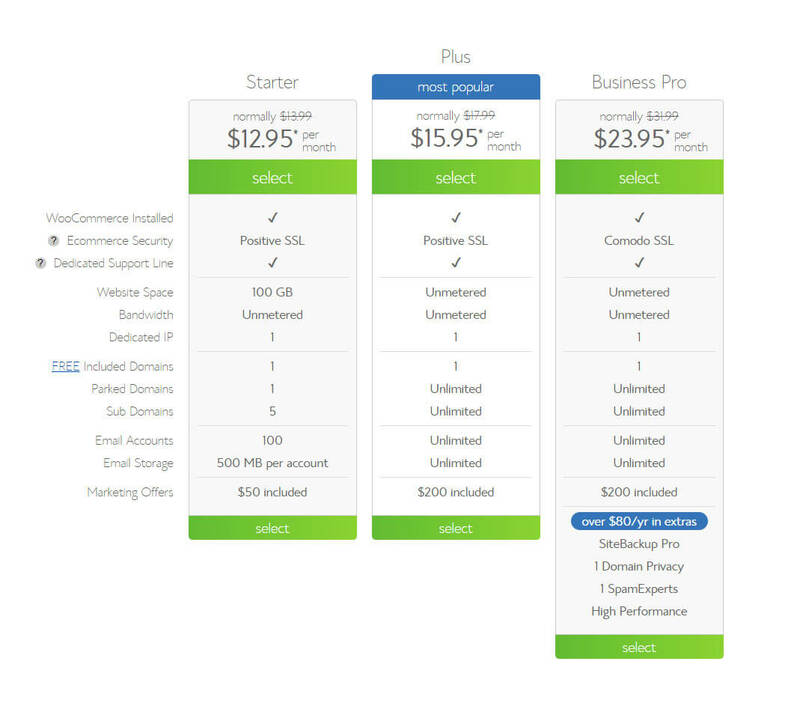 Here you can find our Bluehost vs. Siteground comparison. Can I sell digital goods like MP3s, videos or eBooks with WooCommerce? Absolutely! WooCommerce gives you many options how you want to make your files available. What payment fees does WooCommerce charge? None. However, if you want to provide credit card payment, you will need a service like Authorize.net or PayPal which may charge additional payment fees. Can I run WooCommerce without WordPress? No, this is not possible. WooCommerce is a plugin for WordPress and therefore you need to have WordPress installed. How can I create a multi-lingual store with WooCommerce? You will need a plugin like WPML that translates your store. However, keep in mind that a translation alone normally doesn’t fulfill legal requirements for other countries.